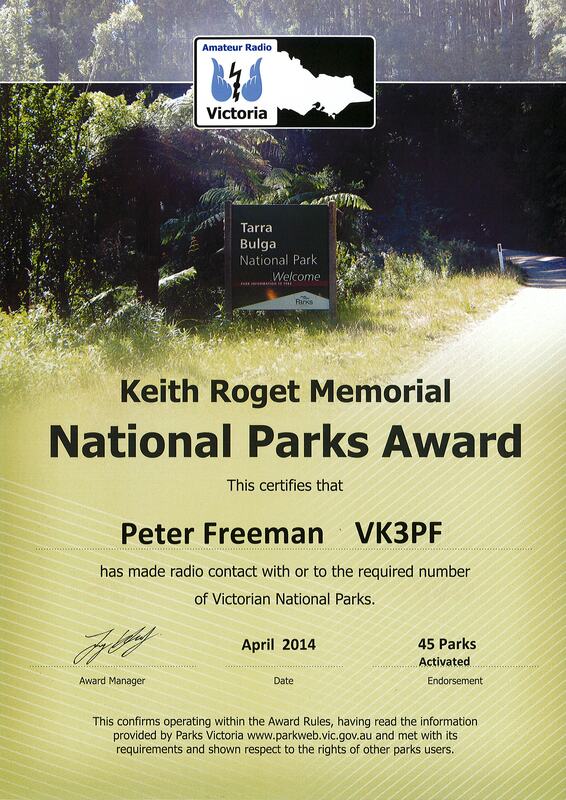 This is the Award for chasing and/or activating National Parks in Victoria (VK3). 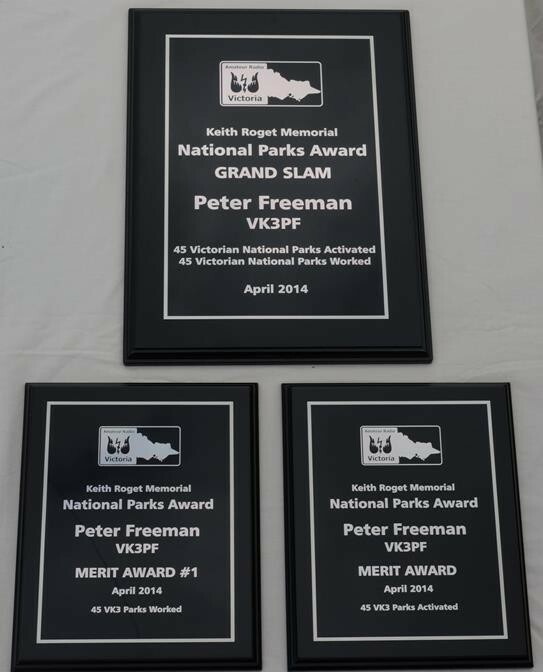 As a result, I earned the merit plaques for having chased, and activated, all 45 Victorian National Parks, and the second Grand Slam Award. 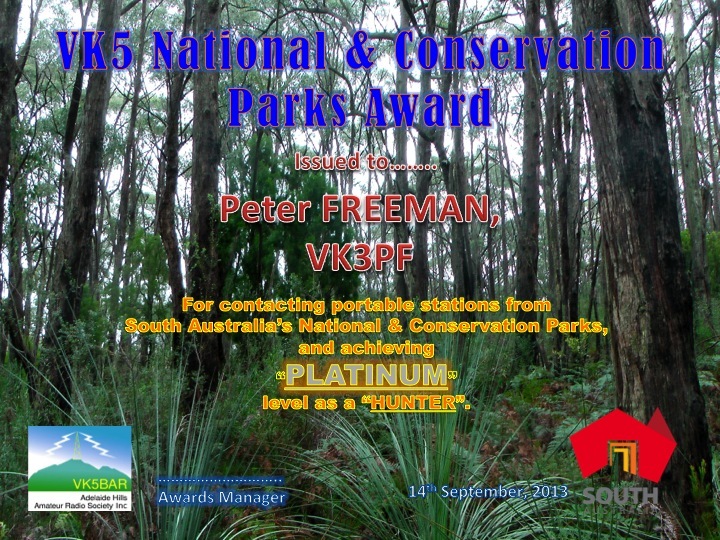 The local Australian branch of the World Wide Flora & Fauna Awards: Same Parks apply for both local and international schemes. 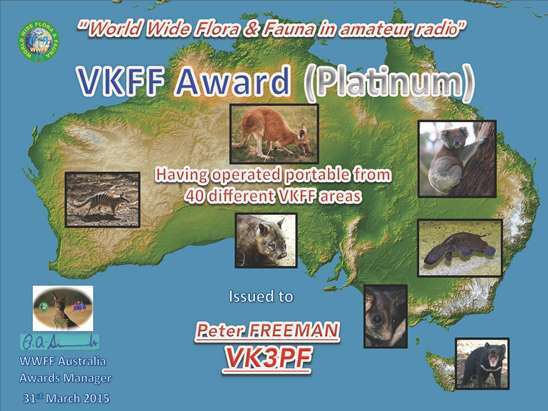 As an Activator, you need only 10 or more different stations worked to qualify the Park for VKFF, compared to 44 different stations for WWFF. 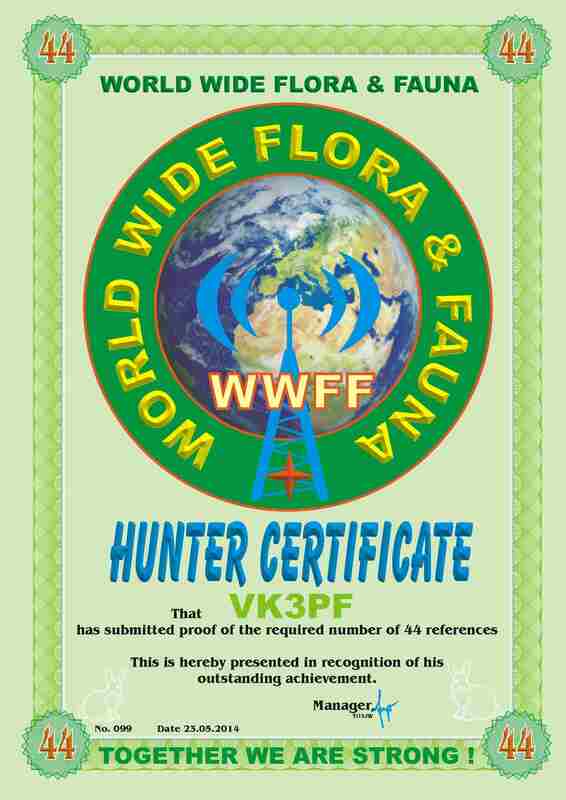 In the WWFF system, chasers are called Hunters, with certificates issued for every multiple of 44 Parks worked. 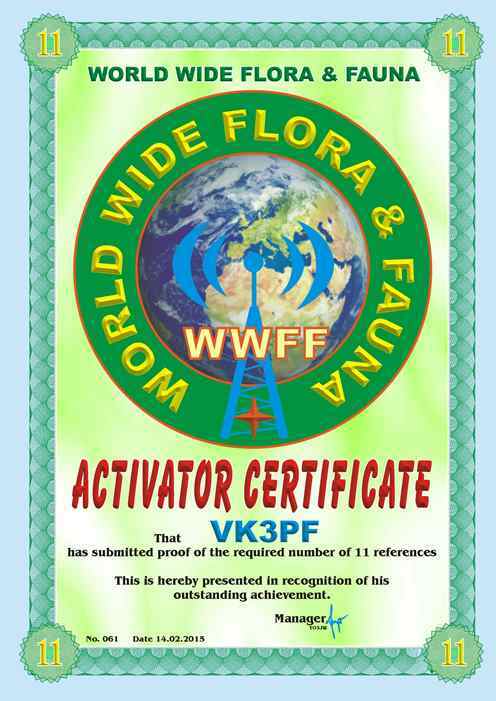 The Activator certificates can be claimed in multiples of 11 Parks activated, with 44 contacts required from each Park. 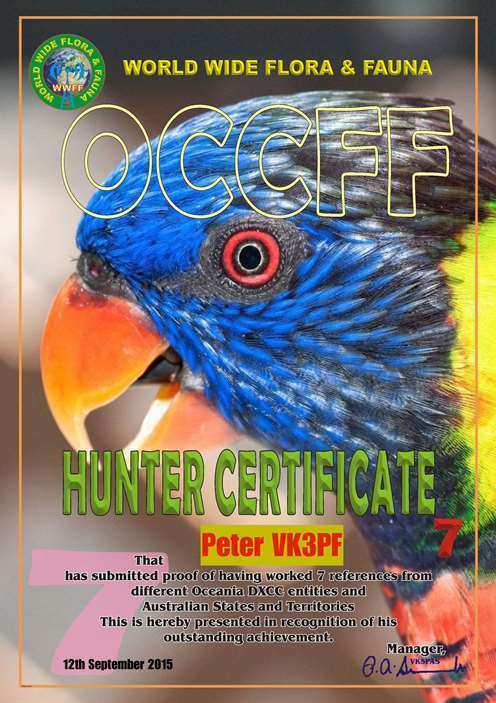 On 10 September 2015, a new global award was announced by the WWFF team: the OCCFF Award: The “OCEANIC continental hunter award, DXFF[OC]-H (aka OC:CFF-H) now available through LogSearch, for working Oceanic DXCCs and the various VK States and Territiories”. 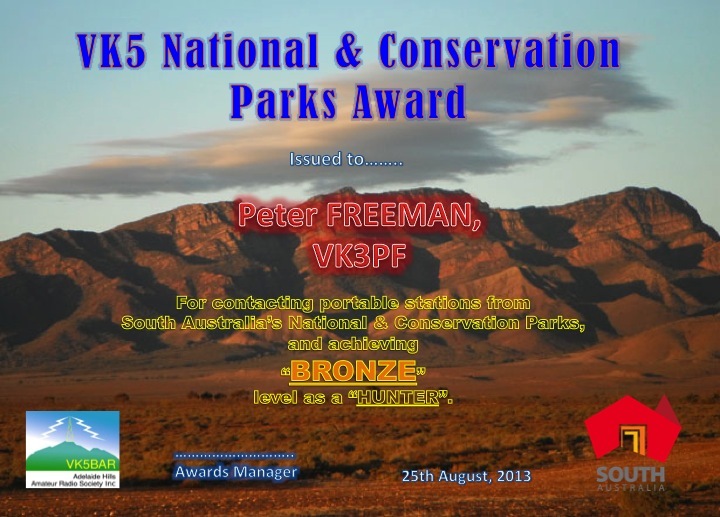 There is a glitch in the database in the early period after release of the award – the submission data forwarded to the Award Manager (Paul VK5PAS) does not correctly identify the correct information. Paul initially rejected my application, but I sent a response email which identified some of the References worked in each state & territory plus other OC references – a list of 10 entities, more than enough for the 7-entity initial award. It took a couple of days (I am sure that Paul was busy vetting applications for the new Award, processing Activator logs and working at his paid job! ), but Paul approved my application. Here is the certificate. 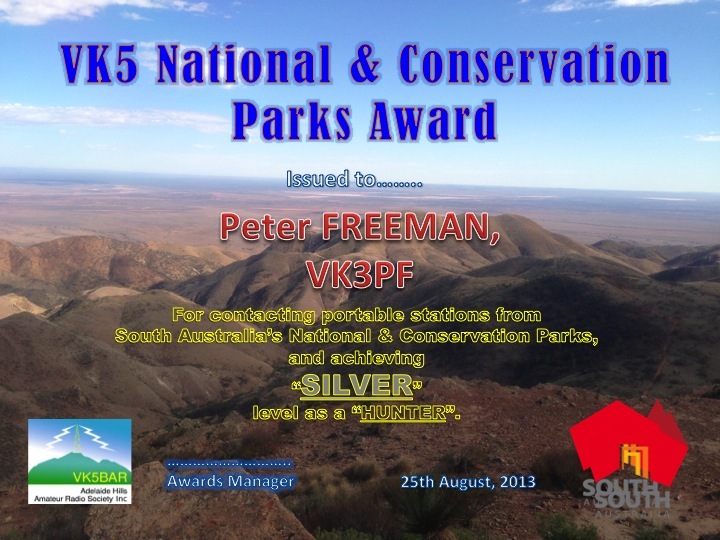 In early 2016, VKFF administrator Paul VK5PAS introduced the Murray River Parks Award for both Hunters and Activators. 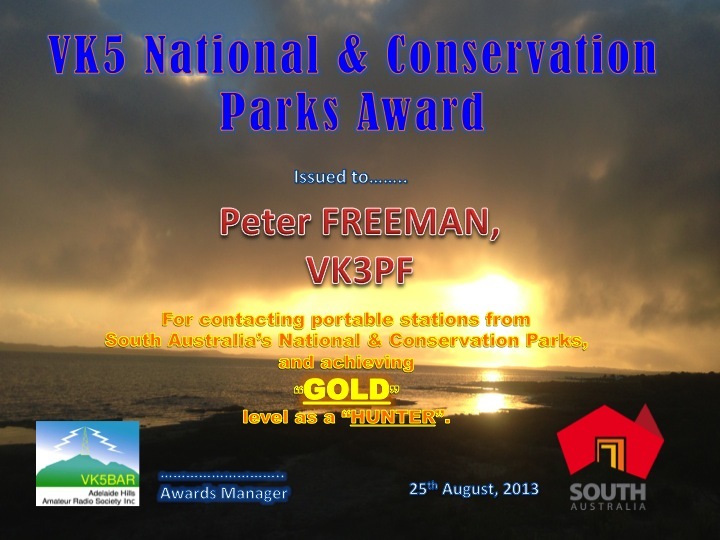 The Award is in steps of 10 Parks.